At some point, we’ve all seen the potential effect of growing older on a person’s mind, whether it’s a mild case of absent-mindedness or full-blown dementia. Just as humans do, dogs’ minds deteriorate with age, and your furry family member can go from being as chipper as ever to seeming lost in a few short weeks. Once canine cognitive disorder develops, it’s very difficult to reverse, so your best way to avoid this is to start working early on keeping Fido’s mind as healthy as possible. Keeping the brain stimulated has equal importance and value for a companion dog as for a person. In humans, we cite the necessity to seek out new experiences, stay active and learn new things. Pet experts almost universally agree that there’s a powerful relationship between mental illnesses such as depression and anxiety and a lack of stimulation aimed at the various sensory receptors. Alleviate boredom and the destructive behavior that often accompanies it. Older dogs might be less inclined to chew furniture or slippers, but constantly licking the same spot on a paw or chewing at the tip of a tail can cause ongoing health problems you don’t need. Reduce hyperactivity, which builds up as a result of not burning off energy. If your dog is bursting with unspent energy day in and day out, mental activity will use up some of it and keep him mellow. Avoids premature aging. It’s a proven fact dogs who are mentally well stimulated through their lives are less predisposed to cognitive dysfunction in their senior years. Overall, mental stimulation is essential for keeping a dog healthy, occupied and non-aggressive, and for managing his levels of stress and anxiety. Working, training, and play are the optimal choices for keeping a dog’s mind healthy as he gets older. This is easy if you’re a sheep farmer and your dog is trained from birth to herd flocks, but for the average American pet owner it can be overwhelmingly difficult. Each of these three activities has its own place in the life of your pet. Playtime is perfect for bonding with your dog or giving him the opportunity to bond with other family members (both canine and human). Training is necessary to enable your dog to work, but once he’s learned the tasks you want to teach him, it’s critical to continue putting the lessons into practice. A trained companion dog is even more likely to become bored and depressed if he’s not stimulated than an untrained one that knows no better. Dogs may only live a few short years, but with dog years to human popularly set at 7, we know they pack a lot more into that amount of time than we realize. Here’s a blueprint you can follow or adapt to your purposes for the lifetime of your dog, which incorporates all three aspects of mental stimulation. “Regular” training in a dog’s world means at least two to three times weekly. Anything less, and your dog is likely to have forgotten much of any new teachings by the next time around. Professional dog trainers typically take classes once a week, but instruct the handlers to practice daily or every alternate day to maintain and reinforce the lesson. All forms of dog training, whether for companion dog certification, obedience, working trials, conformation shows or any other discipline is a slow process that takes place in bite-sized chunks. Each step must be trained individually, and later connected to the steps before and after. Some breeds learn remarkably quickly, while others seem determined never to get the hang of it. Whatever your dog’s breed and the training you undertake, avoid trying to rush it or to push the dog to progress too fast because this will result in anxiety and a loss of interest. How to achieve this: Make a list of the various tasks you want to train your dog to do and break them down into individual steps. Schedule a formal weekly training session with a trainer or club, and plan three other sessions during the week where you repeat the work done at the session. End each session by performing a task the dog has already mastered, so you finish on a positive note with the dog succeeding. Set up a treasure hunt, by hiding a treat or favorite toy while he waits in a down stay. Let him see where you’ve hidden it, so he can find it successfully and be rewarded for doing so. This enables him to understand the game, after which you can increase the difficulty by hiding the item in other rooms, or in one of a group of boxes. He’ll have to investigate all of them until he finds it, and then only get the reward. Play hide and seek with your dog and another person. One monitors the dog in a sit-stay while the other goes to hide, and when the dog finds them, he gets a reward. Teach the dog the name of specific items, by holding the item and showing it to the dog. When he tries to take it, say the name and reward him. By working on this regularly, you should be able to teach him to seek out the item by name and bring it to you, after which you can start teaching another name. Visit this post for a list of 10 popular brain games to play with your companion dog. Some are more complex than others, but there’s something for every level. Getting enough healthy activity is vital for maintaining your dog’s mental health, and there’s no better way to keep him engaged than combining exercise with play. During the dog’s younger years, he’ll be able to run and walk daily as well as indulge in high-energy playtimes, but as he gets older you might find it more challenging to get him to do more than a stroll around the block. Encourage physical activity through developing his ball drive from puppyhood, so even as a senior, he is interested enough to amble across a field and retrieve a ball. Doggy football and going swimming are two more ways to get your dog enthusiastic about moving, especially if you’re doing them together. And if you have access to another friendly pooch, especially a younger one, some play dates could be just the ticket. Few individual tactics are likely to work alone to keep your companion dog’s mind healthy as he gets older. A holistic approach that takes account of his mental and physical stimulation needs, eliminates unnecessary stress, and ensures adequate nutrition and healthcare can help your dog avoid canine cognitive disorder. 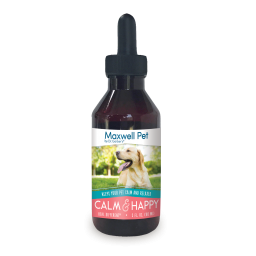 For timid dogs, eliminate unnecessary stressors and consider including natural remedies for dog anxiety like MaxWell Pet’s Calm & Happy into their daily regime. 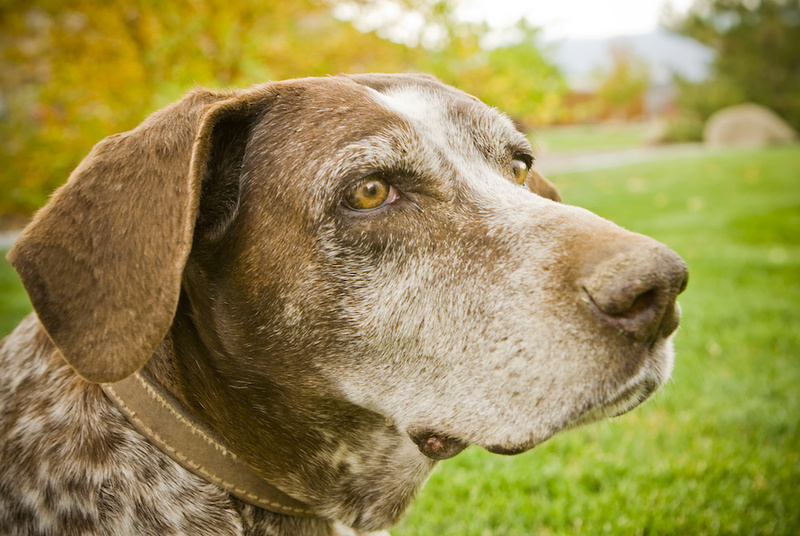 For more information on natural products to help keep your dog’s mind healthy into the senior years, please click here to visit our online shop.